The K Lite Mega Codec Pack 995 - The Ultimate HD Video compressor! How do I get the K Lite Mega Codec Pack 995? What is the best Codec to use to make videos in MikuMikuDance? Which video compression should I choose when rendering to AVI using MMD? How can I make 1080hd videos in Miku Miku Dance? What size should my screen be for HD video in MikuMikuDance? Does Windows Movie Maker give you really poor quality and nothing else works for you? No problem! This problem is solved for all Windows xp, 7, 8 (or older) 32 and 64 bit users! With this codec pack, you can render (in MMD or MMM) your videos in 1080 HD in just under twenty minutes! And plus, if you are using Windows xp, you can open any video or audio you want!! But XP users need to stick to ver 9.9.5 because the latest versions cause MMD and MMM to crash when you try to render. I’m going to show you how in just simple steps, one, it’s completely free so get ready! After downloading the program from looking down the bottom, open it up and when you look at the setup, you can select all audio and video formats, make sure that you have the encoding selected and have it set to Windows Media Player so it can open all video files, it will also give you the Classic Media Player if you prefer a better video Player instead. Make sure that you have DivX and XVid activated, otherwise MMD won’t take it in. But when you’re finished, you don’t need to restart your computer, it runs up right away! Now, when you open up MMD, switch your screen to 1290 x 1080 for the suitable screen size, if you think that’s too big, it’s perfect for a HD quality. Now when you are going to render your video, switch your video compressor to XVid which is listed just above the AVI raw option. You can also see that there are more additions as well so don’t hesitate to try them! Now, when you click on the XVid option, the the video compressor options box comes up, clicking on that, you can set your video to 780, 1080 HD. But there is also the DivX option, that is a codec that allows you to even play your videos on even older TV’s if you want to play it by putting it on a USB and plugging it in to your TV or DVD player and play it! There is a TV that I have that is about 10 years old! No matter what the age or quality it supports, all DivX and XVid videos are supported! But keep it on XVid Home because it still gives you the best quality you want. Press Render, now if you have a really great graphics card, you’ll be surprised by the speed of rendering! It renders for 1 second every ten frames it renders, so you’ll have your video finished in no time and with beautiful quality! But even if you have a low one, it’s still good, it will only take ten minutes longer. YouTube supports the codec as well and even if you upload it, the quality is still good as before! There are no worries for YouTube to wreck your videos quality, it doesn’t do any harm at all. If you want, you can turn the Mega pack on when you go on Windows Movie maker but unfortunately! for the xp version it still gives you a bad quality video, it’s just set that way and it can’t give you anything better. If you don’t have a DVD reader, you don’t need to get one! So scratch that and the codec pack reads it for you and you can’t even see it, it’s in all programs that you use! Happy watching! If you have a video converter, it lets you concert videos in XVid codec now! But depends on how good your program is, you can still get a low quality. It lets you at least download videos from YouTube and convert in 780 HD. Try finding the differences in the programs that you have and you’ll actually realize how much the codec pack has improved them! Did you know that if you take a screen shot picture of your video while it’s playing, open up paint and paste your picture in the program. For some reason, your video is playing in your paint program! O.o but when your video finishes, the moving picture just leaves nothing but the stage. How odd but this is a total mystery. So if you want to take a picture, pause your video first. Here you go! Hope that gave you a huge amount of help!! So I gather you have a 64-bit system, yes? Did you make sure you downloaded a 64-bit version of the *codec pack* as well? That might be a problem. Ok, I got it working! So here’s what I did. Nanashi … I just sent you a long email with several ideas in it … Let me know if something works for you! 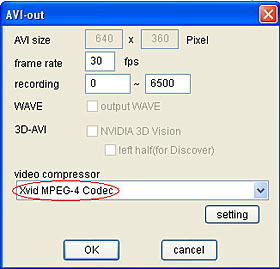 When I go to save the video as an AVI, the Xvid Codec doesn’t even appear on the list. What’s going on? The system isn’t recognizing the codec. excuse me, what do you mean by “Make sure that you have DivX and XVid activated”? where or how do i activate them? could you elaborate more on this please? thank you for making this tutorial. There may be something that is causing MMD to crash, what do you have on your computer? Any other programs that you use? I tried the Xvid and DivX methods, and each time MMD cashed (and yes I did download that K-lite codec). I’m running a pretty good laptop with updated graphics card, yet it seems to fail every time. Any ideas? In the installation of the codec, did you click on all of the video types? If not, you may have not activated them. Make sure that you shut off your computer and turn it on after. But if it still doesn’t work, make sure that you are getting the right 32 or 64 bit version the same as MMD or it won’t be recognized. This is no typo, it is correct. I found a typo: the 1290 x 1080 should be 1920 x 1080, if you meant 16:9 aspect ratio.